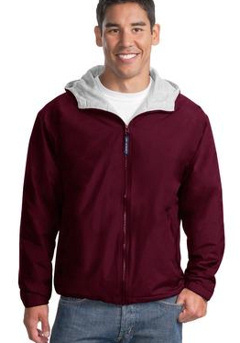 Custom embroidered Jackets - Midweight, Nylon Hooded Fleece, Tri-Season. Michigan OMD Custom Embroidery, No Minimums, Wholesale Prices, Custom Embroidered Shirts, Jackets, Caps & More! The Tri-Season is our best all around custom embroidered jacket with it's water-resistant shell and super soft fleece lining. Great price too! The hooded nylong fleece sweatshirt lined jacket is the perfect mid-weight jacket used for equestrian farms, teams, schools and events. Even casual business wear! Explore the many options of midweight jackets with your custom embroidered logo left chest or full back. Contact us for more details. Mix and match styles to achieve quantity discounts! No minimums, $25 one time set up fee! Life time use of your logo! *All prices include Custom Embroidery! 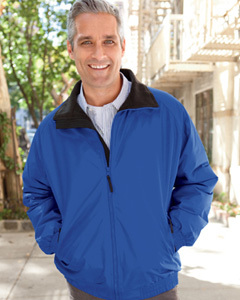 Budget friendly custom embroidered M740 Harriton's Fleece lined nylon jacket. Made of 100% nylon taslon shell with anti-pill microfleece lining; wind- and water-resistant; full front-zip with inside zip guard; InconspicuZipT for easy embroidery; contrast tipped mock collar (except Black); nylon/polyester raglan sleeve lining; outside zip pockets. Custom embroidery included! Free Shipping & Free set up fee (Continental U.S. Only) on 144 pieces or more! One of America's favorite all-purpose jackets for work or play. A custom embroidered Port Authority ® - Team Jacket. JP56 is as spirited as your team or club. With sporty styling, the nylon shell repels water while the sweatshirt fleece lining in the hood and body provides comfort and warmth. 100% Teklon ® nylon shell, Sweatshirt fabric body and hood lining, 100% polyester sleeve lining, Drawcord hood, Locker loop, Slash pockets, Elastic cuffs with adjustable hook and loop closures, Interior pocket with hook and loop closure, Open hem with drawcord and toggle. With a nice hoodie underneath could easily be used as a 3 season type jacket. OMD Favorite! Custom embroidery included! Custom embroidered D700 Devon & Jones Three season Classic jacket. 100% taslon nylon shell with plush microfleece lining; lightweight polyfill insulation; sturdy Black enamel front-zipper; InconspicuZipT for clean embroidery; raglan, nylon-lined sleeves; outside zip pockets, inside zip security pocket; banded bottom. Custom embroidery included! OMD favorite! People simply love the custom embroidered Port Authority® Challenger Jacket. J754 Tri Season Jacket . This traditional design never goes out of style and keeps you warm, dry and confident. And just look at the choices! The ChallengerT is available in everything from camo to youth sizes! TeklonT nylon shell is durable and water repellent, Poly-filled body with heavyweight fleece lining for extra warmth, Rib knit waistband and cuffs, Lower slash pockets, interior pocket (all with zip closures),Nylon lining in the sleeves. Custom embroidered logo included. 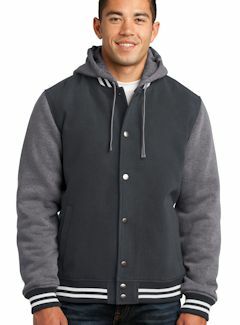 We took the old-school letterman jacket and reworked it in comfortable wool-like polyester with a warm quilted lining. A detachable hood adds versatility. 10.6-ounce, 94/4/2 poly/rayon/spandex body. 9-ounce, 60/40 cotton/poly sleeves and hood. 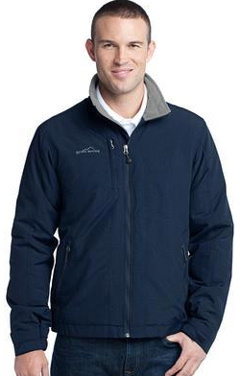 100% polyester quilted lining with 2-ounce, 100% polyester fill in body and sleeve. Detachable three-panel hood with dyed-to-match drawcord. Interior pocket. Rib knit collar, cuffs and hem. 2x2 snap front closure. Front slash pockets. Port Pocket™ at left chest and hem for easy embroidery access. Custom embroidered logo included. 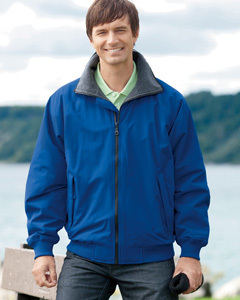 When temps drop, warm up in this exceptional three-season jacket made of wind- and water-repellent nylon with a cozy fleece lining. Reverse coil zippers, interior security pocket, zippered chest pocket, front zippered pockets, adjustable tab cuffs with hook and loop closures and an open hem with elastic insets. Contrast Eddie Bauer logo embroidered on right chest. 100% nylon shell, 100% polyester fleece lining. Custom embroidered included! please visit our online Full Version Catalogs for endless options. and our friendly staff can assist you. *Copyright © 2019 DC Web Design. All rights reserved.